On a cold winter morning, there is nothing worse than putting on your boots and discovering that they are wet. No person in the world has ever enjoyed putting on wet footwear; luckily there are many inexpensive and easy to use electric dryers that can quickly dry out your boots. Electric dryers not only dry out your shoes, so they are toasty and warm, but they can even sanitize and deodorize your footwear, so you get rid of embarrassing odors. These devices are perfect for anyone who skis, hunts, goes fishing, runs, golfs, has kids, has to work outside and anyone who does activities that leave you with wet feet. You can even use these dryers for accessories like work and sports gloves or even helmets and other headgear. 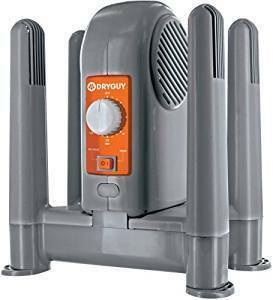 DryGuy is a top brand that produces high quality, reasonably priced dryers. They also offer some different models that work well for various situations. The DryGuy DX is a great option that works exceptionally well for heavy equipment and various types of garments. It comes with one set of extensions for tall styles. It dries effectively but doesn’t get too hot, so it is safe for kids and pets. Users love that it works well quickly. It is excellent for large styles like ski and snowboard boots and is relatively quiet. May take longer than advertised time (4 hours) if the footwear is entirely soaked. Peet is one of the industry leaders in the shoe dryer market. They offer a range of models for different situations and are generally considered one of the best brands in this space. The Peet Advantage 4 is a great model to check out if you are looking for something that is good quality and will get the job done quickly and efficiently. This model is one of our top picks because it has a large very sturdy base that can handle two sets of heavy footwear (i.e., ski boots). It is also great because it can dry items much quicker than convection models since it uses the Air Chambers and DryPorts with a fan. Another bonus is that it is available in 220v electrical configurations for consumers in New Zealand and the UK. What users love: Users love the exceptional quality and high performance of this Peet Device. It also is great for specialty items because you can use the no heat option for more delicate gear. What could be improved? Some users would like to see an increase in the length of the timer option. The Dr.Dry is a straightforward “plug-n-play” type of dryer. You just put them into your shoes or boots, plug them in and leave them to dry. There is no on-off switch, but you can tell the device is running because it emits a glowing blue light. Dr.Dry uses a PTC heater, so it doesn’t get hot to the touch, and if used correctly it should be safe to use with most materials. The manufacturer says it will take 1-2 hours to dry shoes, although some users find it takes longer, especially if you have put shoes through a washing machine and the shoes are saturated with water. Users love the quality you are getting for the price. They also like that this device is more portable than some of its higher priced competitors. Most users agree that the Dr.Dry gets the job done, although it may take longer than the manufacturer’s claim of 1-2 hours. An on-off switch would be a useful feature. The manufacturer needs to clarify how exactly the shoes are being sterilized and deodorized. Jobsite Boot, Shoe & Glove Electric Dryer is a popular option that works well as a dryer, as well as helping to get rid of the odor. It is a good quality machine that comes with different drying time options. That it does a great job getting drying all kinds of footwear and gear. The main benefit to using a boot dryer is that it dries out your footwear. If you have ever put your foot into a wet boot that you then have to wear for many hours, you will know just unpleasant this feeling can be. Your footwear won’t get smelly. Many of the models neutralize odors and help to remove bacteria and mold. Most models are safe to use for many different types of materials like leather, PVC, rubber, neoprene, canvas, synthetics, cloth, fleece, felt, and micro. They can help extend the life of your footwear by stopping it from being ruined by mildew and moisture. What type of shoes can you use? Most dryers will work on the majority of styles. However, if you are shopping for a product for very large or very small sizes of shoes or boots, you will want to pay particular attention to the style you are considering and whether it will work for your type of footwear. There is quite a variety of designs in footwear dryers, the most common being the models that have ports that blow warm air into your shoes. 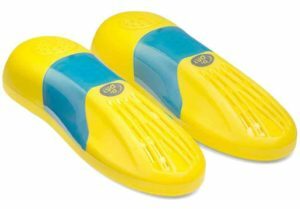 You can also get products that are designed to be placed into the footwear, ones that look a little like an octopus with tubes that come down from the central unit, and some that look like boot racks. The models with ports usually work best for most type of situations. Do you need the device for accessories (hats, gloves, mitten, helmets, etc.) as well as footwear? Many of the companies that sell the port style of dryer also offer specialized add-ons that you can purchase separately. The benefit of buying an attachment is that it will channel the air consistently to the area you are drying, allowing for better and quicker drying time. How many items will you be drying at one time? If you are only going to be drying one set of shoes or boots at a time, it is best to stick to the dryers that have two ports or are only capable of drying one item at a time. If you are drying multiple items, there are a few models that have multiple ports. How portable do you need the device to be? If you are going to be traveling with the dryer (i.e., taking it on camping, golfing, ski trips, etc.) you will want to look for a device that is lightweight and easy to pack. If you need a portable device for camping, fishing, hunting, etc. where you have access to a car, there are a couple of products that have a car adapter that allows you use your vehicle as the power source. If you are in a situation where there is no electricity available, you will need a device that is either battery-powered (only a couple of models) or Peet offers a propane-powered product. Where are you planning on putting the dryer? Some dryers run off a fan and can be too noisy for some users if you are sensitive to sound look for models that say they are whisper quiet or plan to keep the device in a room that where you won’t hear it. Are you looking for a dryer only or do you need the heavy-duty odor killing option? If you only need a dryer, you can pay less and get an inexpensive device. Drying the footwear will kill off most of the odor and odor-causing bacteria, however, if an odor is a big problem look into the products that have ozone or UV technology to ensure that the bacteria and the smell are being killed off. To find the best device, you will want to have a close look at the different types of features that are offered on the various models. There are a few different types of power supply options for dryers. The most common is a standard plug into a 110-volt wall outlet; the best performing and most popular models have this type of power supply. 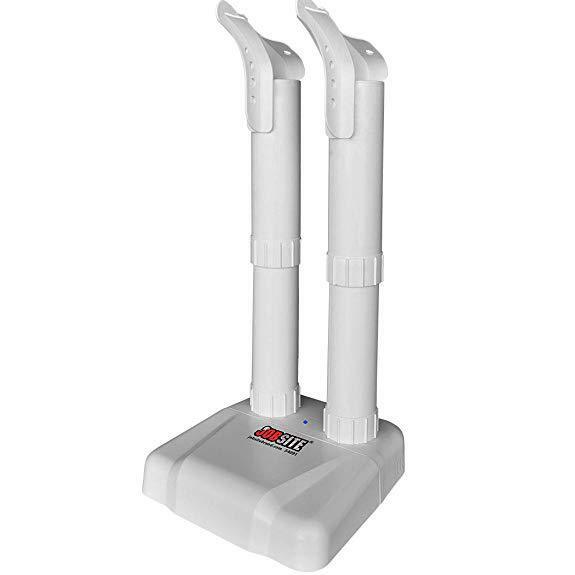 Since a lot of outdoor activities like camping and hunting are often the times when you suffer most from having wet footwear, manufacturers also have models that have adapters that you can plug into your car like the DryGuy Travel Dry DX Boot and Shoe Dryer. There are a couple of battery-powered models and Peet, offers a Propane Powered Boot Dryer, which is an excellent option if you are hunting or camping. Most of the most popular models offer a timer as a feature with the various time setting options. A timer is a useful feature to look for since drying time will vary depending on the saturation level and the type of material that you are drying. Also, you want to avoid over-drying your items. Dryers are pretty versatile in their ability to dry equipment and gear other than just footwear. Some companies offer accessories for things like children’s mittens or different types of helmets. If you are planning on using the device for items other than footwear, it is recommended that you use these attachments to avoid overheating your device. Lots of activities that cause wet boots to happen while you are away from home (skiing, hunting, golf), so it’s handy to have a device that is small and lightweight to take along if you are traveling. If you are buying it for your home, the size of the product it is essential to consider if you are looking for a dryer that won’t take up a lot of extra space. The standard warranty for these types of products is a 1 to 2-year limited warranty from date of purchase. As a side note, Peet offers different length warranties for different models. It may be of interest to some customers that they provide a 25-year warranty on their made in U.S.A models which include the Original PEET ®, Multi PEET ®, Wader PEET ®, and the Powersport PEET ®. 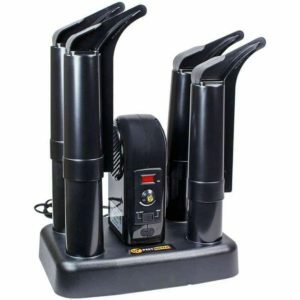 You can get boot dryers starting from around $30. The most popular models are in the $50 price range, while deluxe models with extra features range from about $100 to $150. Most consumers will be able to find a good quality model that will suit their needs for around $50. You can buy them at Walmart, Target, Costco and outdoor stores like Bass Pro, as well as from online retailers. These types of dryers couldn’t be easier to use. Depending on the model you purchase, you attach your footwear to the device, turn it on, leave it running anywhere from 1 to 4 hours (depending on the product you select and the saturation level of the shoe). Once the drying is complete, you remove the item, and you now have wonderfully dry boots or shoes. If you have small children or pets, ensure that any device you purchase doesn’t get hot to the touch (none of the big brands do). You should also ensure that any dryers you buy have all UL listing and CSA certifications; this is important to avoid buying a product that could be a health or fire hazard. Also do not use dryers in shoes that are soaking wet with dripping water, as it can be a fire hazard. An electric boot dryer can be an excellent addition to any household. They are much easier to use than trying to dry your shoes by leaving them out in the sun or on an air vent. They are relatively inexpensive and can aid with shoe comfort and help stop odor. The products that are on the market have been honed and refined over the last 20 years to the point that they give excellent results in a short amount of time. We highly recommend boot dryers for anyone who works or plays outside and is prone to finding themselves with wet footwear.